Back...and not-so-much "better than ever"
It's been two months and sixteen days since my last post. Ahem. I'm officially done with school for the semester. My next class isn't until August, although I still have plenty of school-related work to keep me busy. (You should see the stack of books I want to get through before August, ahem.) Still, no weekly assignments or papers to be turned in for awhile, so things can get more relaxed and predictable. I'm done with most of my travel until our summer events in July. I have a mid-length vacation planned with my husband in May (a few extra days around Memorial Day weekend), and a speaking engagement in June, but that one is within an easy drive and won't take a whole weekend. And although I still have some evening conference calls, it's not nearly the volume we had earlier in the year. So I feel like I'll be able to have a life outside of work and school for awhile! But it wasn't all "work and no play makes Jane a dull girl." Although I haven't had the time or energy since my retreat in February to do much in the way of quilting (none) or embroidery (two evenings, about 20 mins each, as I recall), I did succumb to "quilting/embroidery preparation," so to speak. As I was driving home from a set of meetings in Exton, PA, I saw a quilt shop in a plaza on my right. There may have been a squealing of tires. Welcome to The Quilt Block, Inc. (Their Facebook page is a little more active until they finish getting their website put together.). This was a wonderful store! I was the only customer there at the time so I had a nice long chat with one of the owners, Cynthia (with thanks to a reader who was able to identify her for me so I could update this post accordingly). She mentioned, by the way, that since she'd opened in 2006, 10 other quilt shops in the area had closed. I was surprised to hear that since there's a very fine national quilt show in the area--I would think that would equal a solid fan base locally. I guess not in this case, although it may also be that property values are so high in the areas surrounding Philadelphia that the overhead shuts them down before they can even really get started. 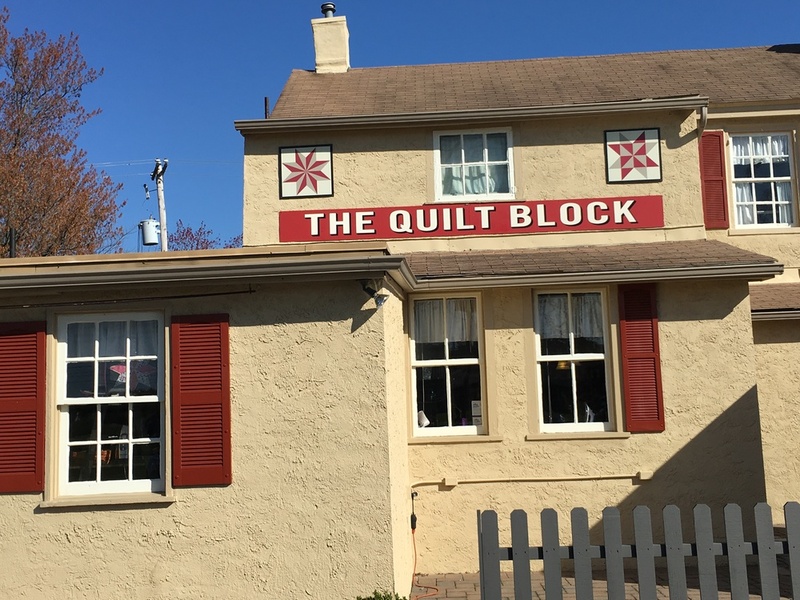 In any case, if you live in the area or are vacationing around Philadelphia/Valley Forge, make sure you check out The Quilt Block and keep them in business! And yes, you're seeing right, that's an Annie Unrein pattern. I love her stuff, even if I do whine every step of the way in making it. To be clear, her patterns and instructions are actually extremely well done. We just all know how I feel about this kind of sewing. But I keep going back to the well. The green box is a bit of over-packaging for embroidery needles. The owner spoke highly of Tulip brand and I'd never tried them, so this is an assortment collection. The two buttons were irresistible. The one with the red circle and slash has the word "mending" behind it. The other one says, "No you couldn't make that." At least, they gave me a giggle at the end of a long day. And yes, that picture was taken on a hotel room bed. I've seen a lot of those lately. What's not shown here is that...and I really can't believe I did this...I signed up for the store's embroidery/quilt block of the month. Apparently I was having a really weak moment. I posted about this on my Facebook page so I won't say more here. 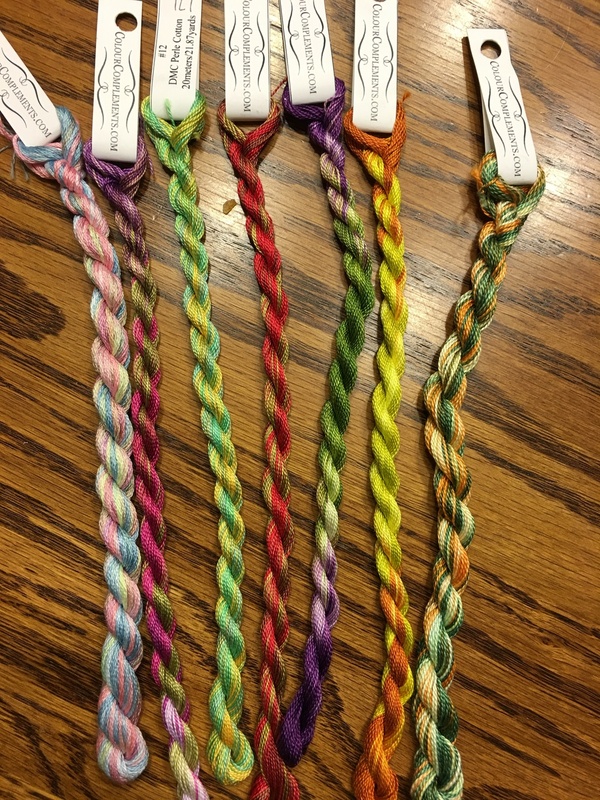 One of the brief times I was home between travel, I saw on Mary Corbet's blog an announcement that my favorite Etsy shop for hand-dyed embroidery threads, ColourComplements, was having a sale. So I bit. Lovely. Lorraine does a beautiful job. On the quilting front, most of what I need to do to finish up UFOs is machine quilting, so I decided to pick up a couple of classes that I'd been looking at. I now own Jaquie Gering's Creative Quilting with Your Walking Foot. It's been on my wish list for a l-o-n-g time and I've heard Frances of Off-Kilter Quilt and others speak highly of it. I also picked up a newer class, Quilting with Rulers on a Home Machine with Amy Johnson. Color me intrigued. I don't own any longarm rulers but if she convinces me it's the thing, I'd be happy to pick some up. And now you're going to laugh. And laugh. And laugh. Remember that Annie Unrein pattern I referenced above, and what I said about whining my way through projects like that? 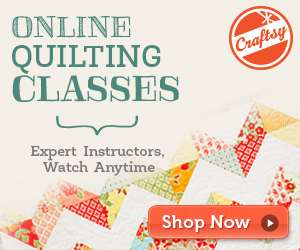 Well, she has a new class on Craftsy. Again, did I say I've had a few weak moments? This one, though, makes a certain amount of logical sense. Her new class is The Ultimate Travel Bag. We can all agree I do a lot of traveling, right? And I'm always on the lookout for that perfect carry-on, weekender, totebag...whatever. I haven't found it yet, but I live in hope. However, I need to finish the second bag from the Annie Unrein class I started last year before tackling this one. Still, there's no reason I can't start digging through my stash to see what fabrics I can use, right? I'm going to talk more about this in my next podcast episode--and yes, there will be a next podcast episode soon!--so for the purposes of this blog I'm just going to get a few things down in writing for my own clarity. Being back in school has not been good for my health, sadly. So I've got a few goals now that I've got several weeks on end where the word "routine" can actually come back into my vocabulary. Get back into an exercise routine. Includes, but not exclusively, canal walks with the Doofus as he's put on a couple of pounds this winter himself. Clean my office/sewing room. Things have gotten a bit stacked and muddled these last couple of months. Get my dogs to the groomer. Yikes. I just want to start doing it again, regardless of which project it is. Technically speaking, I have a few projects in the works but they're all just me playing around--no deadlines involved. So my crazy quilt blocks tend to take priority, but I also have my crewel embroidery project and one purchased embroidery pattern I'm poking away at when I'm in the mood. This is where I have the most specific goals, although I'm not pressuring myself on them. Get the binding and label on the Jacob's Ladder quilt. Get the second bag done from Annie Unrein's Sew Sturdy Travel Organizers class. Find the fabric for the travel bag in Annie Unrein's The Ultimate Travel Bag class. That's it! My daughter just showed up and she's making me vegetarian avocado/tomato burritos (her own concoction, no recipe) for lunch. And then...the Clean Sweep is on.